She's back! 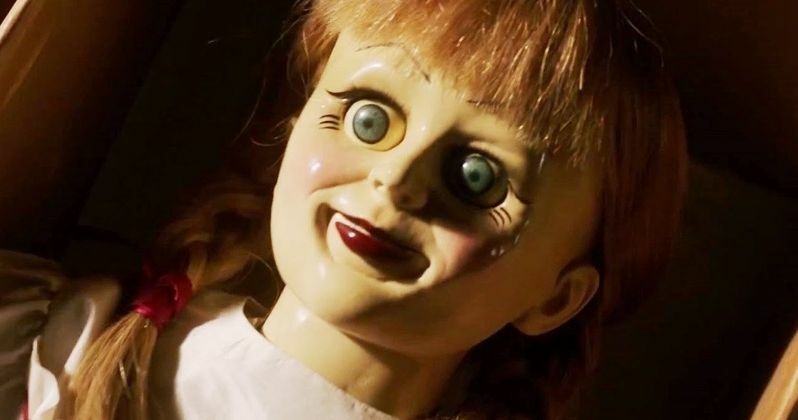 The first Annabelle may not have been all that well received, but it raked in enough money at the box office to justify a sequel. But if looks like Warner Bros. doesn't want to make the same mistake twice. The studio has just released the very first trailer for Annabelle 2, officially titled Annabelle: Creation, and it looks like this movie could be what fans were hoping for the first time around. www.warnerbros.com|Warner Bros. initially teased this first trailer for Annabelle: Creation recently by releasing a brand new poster for the movie, which has the terrifying doll on (almost) full display. It wouldn't be a horror movie poster unless we gently cloaked something in shadow, now would it? They also released a brief trailer tease that showcased the actual creation of this creepy doll that was first seen in The Conjuring back in 2013. This video gives us a very good look at what director David F. Sandberg was able to do with Annabelle 2. Here is the official synopsis for Annabelle: Creation. "She's back! From New Line Cinema comes Annabelle: Creation with David F. Sandberg (Lights Out) helming the follow up to 2014's hugely successful Annabelle, which scared up nearly $257 million at the worldwide box office during its run in theaters. The new film is once again being produced by Peter Safran and James Wan, who also partnered so effectively on The Conjuring movies. In Annabelle: Creation, several years after the tragic death of their little girl, a dollmaker and his wife welcome a nun and several girls from a shuttered orphanage into their home, soon becoming the target of the dollmaker's possessed creation, Annabelle." Those who saw the first Annabelle may be a bit hesitant about watching another movie centered on the haunted doll, but there is reason to believe, even outside of this teaser, that Annabelle 2 will be different. David F. Sandberg directed Lights Out for Warner Bros. as well which, by most accounts, was pretty great. It also doesn't hurt anything that the movie did very well at the box office. Speaking of box office, the only reason Annabelle: Creation exists in the first place is because the first movie made $256 million from just a $6.5 million reported production budget. That, despite the fact that the movie currently has a terrible 29 percent approval rating from critics on Rotten Tomatoes, as well as a very poor 36 percent audience rating. Warner Bros. wants The Conjuring brand to be in good shape moving forward, since they have The Conjuring 3 and The Nun both in the works. So, it isn't likely they would damage the brand by putting out another sub-par movie. The movie stars Stephanie Sigman, Talitha Bateman, Lulu Wilson, Philippa Coulthard, Grace Fulton, Lou Lou Safran, Samara Lee, Anthony LaPaglia and Miranda Otto. David F. Sandberg is directing Annabelle: Creation from a script by Gary Dauberman, who also wrote the upcoming IT adaptation and is writing the next Conjuring spin-off, The Nun. Annabelle: Creation is set for release on August 11. Be sure to check out the brand new teaser trailer for yourself below.